Looking for a guide to know more about CS:GO Ranks? Want to improve your CS:GO ranks? Then you’ve come to the right place. Counter-Strike Global Offensive (CS:GO) is one of the most popular first-person shooter played by millions of people across the world. If you’ve already played CS, then you would have come across the concept of ranking in the game. But if you are just starting up with CS:GO, then csgo ranks will be completely new to you. In this article about csgo ranking explained, you can get a clear idea about csgo ranks and how to move higher up in the ranks. So what is CS:GO Ranks all about? In first-person shooting games, it is important to enhance your skills often to compete hard and move higher up in the levels. In the exciting game of CS:GO, ranks do play an important role as it helps in playing with players with similar ranks in competitive matchmaking. Similar to ELO rating, the CS:GO ranks will be used for identifying players of your same skillset and playing against them. The more you start winning the sooner you can move higher up in the counter strike global offensive ranking. What are the Ranks available in CS:GO? There are totally 18 csgo ranks available in CS:GO and higher the move up the ranks the more competitive your battles become. Ranks are basically split into various levels as you can see a level with similar kind of skills. But you can still see some players far more experience and better than other players with same skills. So with the CS:GO levels provide the players with a level playing field and you can expect some better results. The communication and strategy differ from level to level and that’s one of the interesting aspects that makes CS:GO an exciting game. 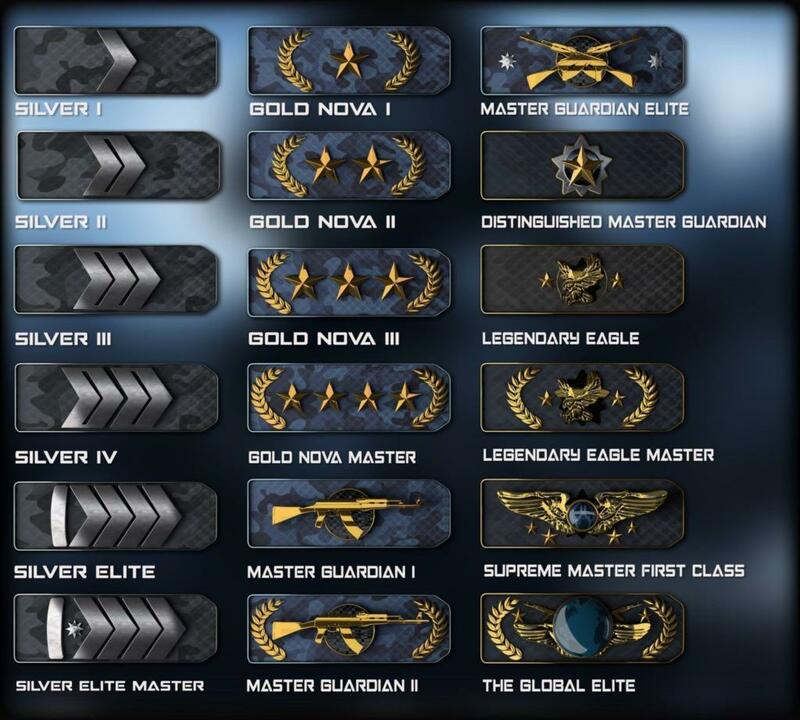 When coming to the csgo ranking guide, the Silver ranks are the first rank you can achieve when starting up with the game. And you can only find newbies and beginners of CS:GO in this level and don’t expect lot of strategy or skill here as this level is used to get used to the game and have fun. But you can even come face to face with higher level players, who in order to boost their rankings and value can be lurking in these levels too. But better you get through this beginner level soon if you are looking for some battle with players with some skills. But be prepared to face some challenges from some smurfs who may make it tough for you sometimes to cross this level. Once you’ve successfully crossed the Silvers, it is the Nova level. It is a level that provides you with several options to learn new strategies. Even though you can find better players with clear strategies here, still the communication may seem to lack here. But the level certainly guarantees for a lot of challenges which makes the level much interesting than the Silver levels. The starting ranks in the Nova level are much easy compared to the higher levels as they involve a strategic approach and skilful play. The level is certainly not a walk in the park when compared to the Silvers as your skills and strategies are tested. But this is a much-needed level for you in terms of the amount of experience you gain playing through this level. And successfully cruising the Nova levels, you enter into Master Guardian level. This is a place where come face to face with advanced and professional players. And these players have a thorough knowledge of the game and come with a lot of strategies. Getting through these stages is obviously tough and it takes a lot of battles and lessons to be learnt. The more time you invest in the game helps you understand the strategies of other players and create your own strategies to beat your enemies and move to the elite levels. And if you have reached the elite levels, consider yourself as some the best in the game. Because elite players are truly elite as the name suggests and this level can be time-consuming and stressful. Elite players are professionals and know each and every detail of the game in their fingertips and definitely brings with a lot of challenges. Before you get to the competitive rankings, you need to go for the profile ranks. And to win the profile ranks, you need to win rounds in various matches and move high up in the profile ranks. You may even get additional points based on the performances of your team members. And the XP you ear is also determined based on the rounds you win and also based on your scores in the matches. So if you want to go into competitive matches, then you need to have at least a profile rank of 2. With every 5000XP you earn, you go higher up in the profile ranks. And if you play a lot of matches and gain more XP then you are bound to get some multipliers as well. When compared to the profile ranking system in CS:GO, the competitive ranking is a bit difficult to understand, especially if you are new to the game. Even though many say that the CS:GO rankings are largely similar to Elo rating, it is still not clear about how ranking works in CS:GO. the ranking system involves a lot of different factors and hence you cannot determine how a player is ranked in the system. The reason the method of ranking is kept as a secret is to prevent players to game the system with cheap tricks if they know how exactly points are scored and ranks are determined. But if you are a beginner in CS:GO and want to earn your initial rank, then you need to play at least 10 placement matches and in those, you need to play at least 2 matches per day. This limit of 2 matches per day also allows the system with enough time to look into each player’s calibre. Only when earning 10 wins, you’ll be assigned to the skill groups. And your performance in the placement matches determine which groups you will be placed to. Still, there are a lot of theories floating around the internet about how players are assigned to skill groups. But the basic concept is all you need to do is increase your chances by improving your performance as a team. And another interesting aspect that separates CS:GO from other games is that it keeps closer to the game always or else you may lose you skill groups. Yes, if you are inactive for more than 30 days, then your skill groups will disappear and only a win or a draw will allow you to get it back. How to move higher up in the Ranks? To move higher up in the ranks, obviously you need to start winning games and when you have won enough games, then automatically you rank up. And in a similar way, if you lose games continuously, then you will get degraded. According to Valve, CS:GO comes with a ranking system that closely resembles the Glicko-2 ranking method. And with Glicko-2, the algorithm is largely based on the influence of the player in their team, their team’s performance, number of kills, deaths, damages, bomb plants etc. It is said that every action of yours is rated with some hidden points which help in determining your rank too. Generally, the best way to increase your points is to approach a game in the aspect of winning the game rather than making most kills. So even if you make a lot of kills and your team is still losing, then your kills won’t be of much use in your ranking aspect. But when you are in a position where you are going to be deranked, the number of kills might act as a saviour there. Generally, if you are looking to move higher up in the ranks, then you need to team up with players with similar goals like you. So try to team up with serious players as you will end up increasing your chances of winning more rounds and easily moving up the ranks. There are many online CS:GO communities where you can connect with some passionate and serious players of CS:GO and try to link up with them. Warmup is essential as to practice yourself, before landing into matchmaking, it enables you to focus better and be effective. Dm works out fine, but there are tons of custom maps on the workshop to help you out with it. This is sort of a precaution is better than cure scenario. It’s advised to make a team and play, as for better communication and coordination. Not doing so, results in salty, cancerous and noob teammates, which will make you rage and eventually affect your gameplay and performance overall. Go on a few dms, or casuals, find some chill out guys, and ask them for a match or two together, eventually, you will form a team this way. Now that we have talked of having yourself warmed up and giving your best, this tip does IMPROVE your game, and develop it further. Most people focus on going for frags, but in order to better your game, and rank up faster, play as a team player. Plant bombs, defuse them, help your teammates out, and that will help you rack up those MVPs. Watching professional matches will enable you to catch on some game sense, it’s a great way to learn strategies, smokes, and pre-fire locations. For this, all you need to do is, go in-game or simply hop over youtube/twitch to catch some action! Every now and then, there are leagues taking place, where top teams compete, and those matches are really worth a watch. Adjust your crosshair, sensitivity, viewmodels, etc. All these small factors do improve/degrade your playing experience, especially your sensitivity, and crosshair. They are key factors in aiming, and having them to the perfect stage is necessary, for that, you can subscribe to the following maps and play around! Q. What is a CS:GO Skill Group? Ans. CS:GO comes with an excellent rating system that rates people based on their gameplay. And people with similar skills are grouped together in similar skill groups so that it provides a level playing field for the players. How to see which Skill group I belong? Ans. So after you have played some placement matches and won 10 competitive matches, you should be able to see your Skill group on the main menu. Generally, your skill group is mainly displayed in the main menu and you can even find it displayed in the match scoreboards as well. What is a Profile rank? Ans. Profile ranks are different from competitive rankings as they are largely based on the amount of XPs you earn. And only if you have a profile rank of 2, then you can enter into competitive mode. I want to go into competitive mode, but stuck in profile ranks for a long time? Ans. Never worry. Rome was not built in a day. Everything needs a bit practice, patience and understanding. And why don’t you think of it on the positive side? The more you are in the profile ranks, you may understand it better and you are only a few matches away from the competitive mode. How my skill is predicted with just winning 10 games? Ans. When you are new to the game, CS:Go doesn’t know anything about your skill. And the reason you are limited 2 matches per day is to allow the system to know more about your gameplay and skills and by the end of 10 matches the system comes to a definite conclusion of your skills and ability and can put you in the right skill group. Hope this csgo ranking explained guide would have provided you with enough information on the counter strike global offensive ranking system and if you have any queries or suggestions with this csgo ranking guide, please post your queries in the feedback section below and we’ll be happy to reply to you at the earliest. This entry was posted in CS:GO Tips and Tricks. Bookmark the permalink.